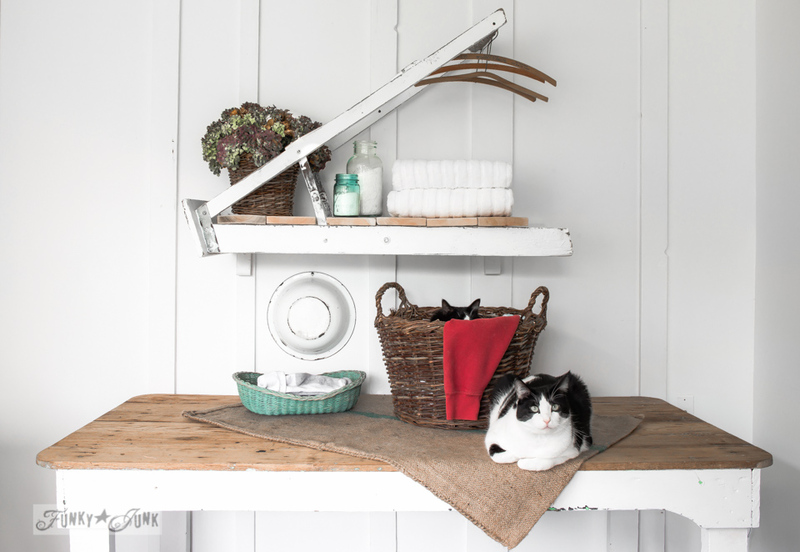 What does a rickety ladder have in common with two cute cats? For starters, they landed in a magazine! Hello there Country Woman! It’s been nice creating for you once again! When I was summoned to come up with an upcycled project, my eyes fell on an old ladder, destined to be something much cooler…while still remaining a ladder. Thinking I was going to stage it IN my actual laundry room, I not only did this project, but I worked on the laundry room itself. Remember the before? I painted the walls a lovely fresh white, added some random board and batten walls and was ready to hang the ladder! But… the room was too dark for magazine quality pictures. Oh well, my laundry room is much prettier these days regardless. So thanks Country Woman, I’d bet you had no idea I’d be making over a room too! So while I was shooting away, my two little buddies wandered in, and curious as can be, made themselves comfy. And wouldn’t you know… THIS is the shot that landed in the mag! Would you like the ladder tutorial? 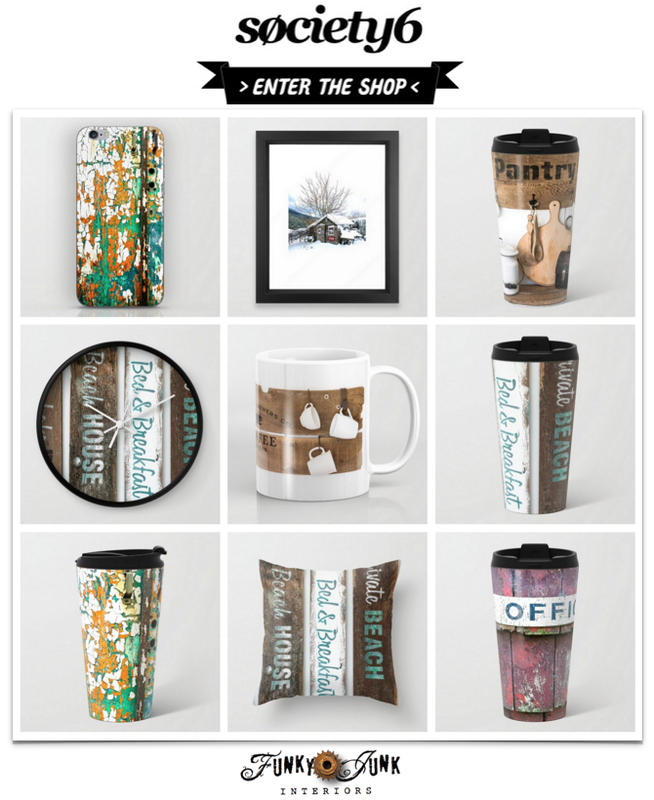 Visit Country Woman’s website HERE to check it out! Or better yet… get the magazine. It’s in the new April / May 2015 edition. And just so you know… I joined two others with their upcycled projects. 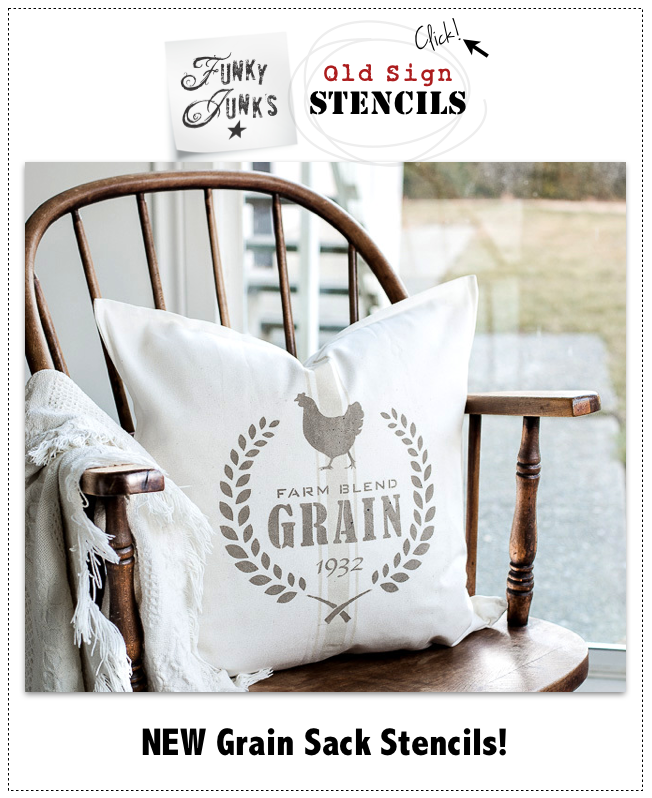 Check out KariAnne of Thistlewood Farms’ project HERE. And the third project is this incredible armoire turned… well, check it out HERE. love this idea Donna! 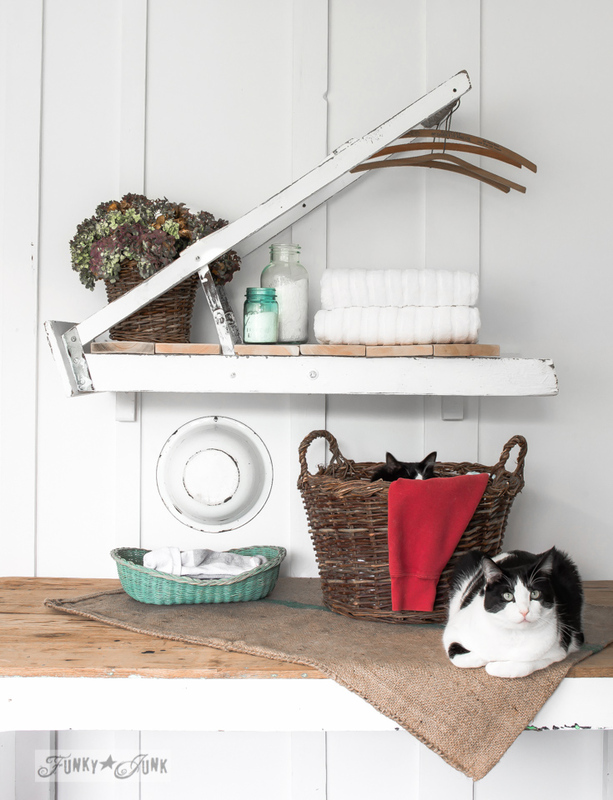 and love even more Skyes ears just peaking over the basket and the paws tucked in kitties do that when they feel very comfortable and secure in thier home best laundry room ever! oooppps forgot to say Lake sitting with paws tucked in! love, love, love this idea. 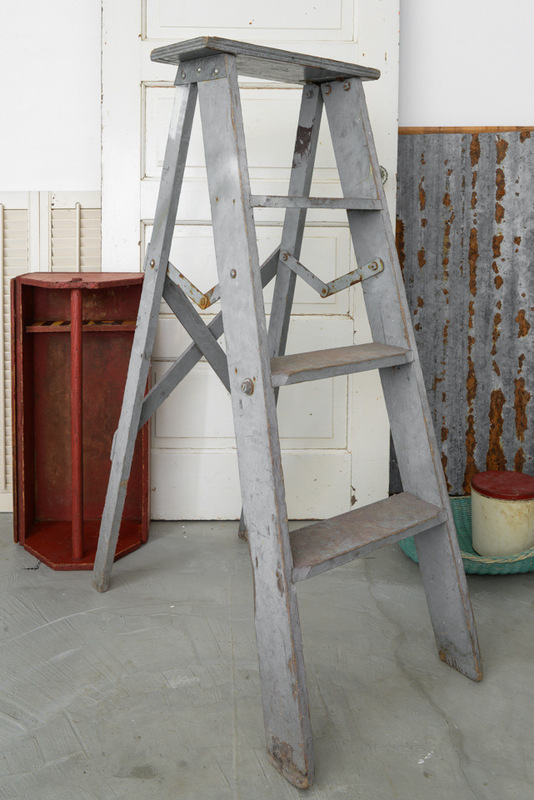 I have my dad’s rickety ladder and could not part with it soooooooooooooooo this is a perfect way to save and use it. Fell in love with your two cats since the first time you showed their adorable faces. another comment…I don’t think I will paint the ladder as it has years of my dad’s paint projects all over it, lol. Carole, I have a rule… I always try things as is before painting them. I even did that to this grey ladder. But ultimately, the white won THIS time! 🙂 I’d leave your dad’s ladder too! Haha, you are so overdue to put that ladder to work! I love this project. My laundry “room” is in the basement dungeon and could use a lot of help. Also love the models in the picture. Now that’s the coolest use for a ladder I’ve seen in awhile. 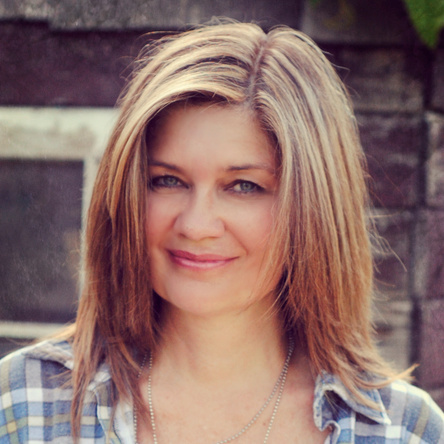 Congrats to you and your adorable kitties for the magazine feature! Love the little ears peaking out from the basket – too dang cute. Awesome. Are the cats giving out paw-tographs yet? Oh my goodness Donna! I just love this idea!! I love this! Congratulations on your magazine feature Donna. Is there anything you can’t turn into a fabulous and functional work of art? Aw, so sweet, complete with kitties 🙂 I have my dads’ old ladder, and I’ve been trying to come up with something to do with it. I don’t have a laundry room, but this is a great idea! Congratulations fellow magazine girl! 🙂 Great project!! Haha, yeah, let’s both get a mag, sign it and swap! Mischievous lil one, chewing the clothes? Oh I know! And it wasn’t planned. They seriously joined me while I was shooting pictures. I was laughing myself taking them! 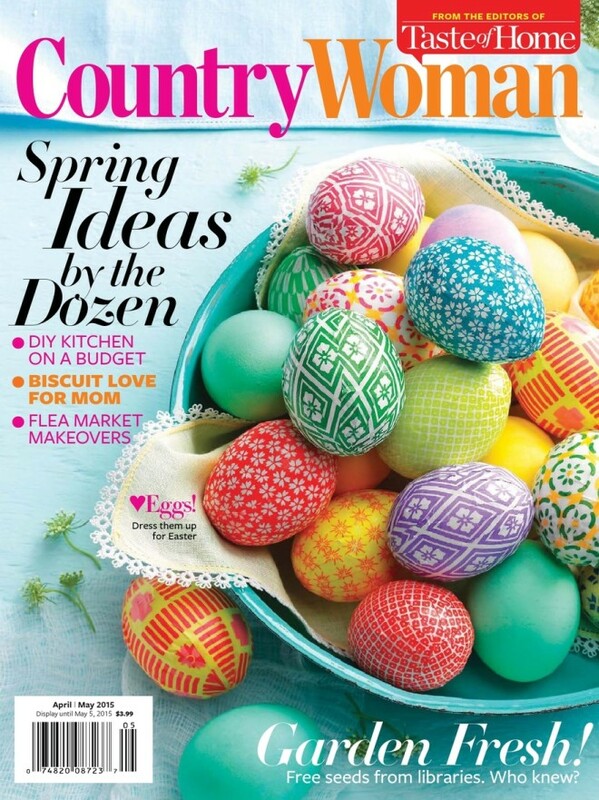 Congratulations on the Country Women April/May issue. Love your ladder idea….very functional and you have done a wonderful as usual. I see the kitties are making themselves very comfortable in the laundry room. Donna – It wasn’t until I placed the image on the page of Country Woman that I saw the second kitty poking out of the basket – sooo cute! We’re all animal-lovers and we loved it. Reading your back story to the shot is icing on the cake! Thank you for the fun project and adorable photo! Haha, too funny! I laughed when I caught that pose too!